Strong demand among business and leisure passengers influenced Norwegian’s May traffic figures. The company carried more than 2.6 million passengers this month, an increase of 265,515 from the same month previous year. The load factor was 88.3 percent, up 3.4 percentage points. 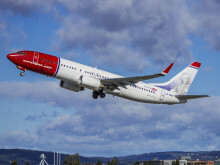 Norwegian has received tremendous support for its Ireland-based subsidiary Norwegian Air International (NAI), which is awaiting approval from the US Department of Transportation (DOT) for its air operator certificate . On April 15, the DOT issued an order proposing to grant a foreign air carrier permit to NAI and the airline looks forward to DOT’s final order finalizing its decision. Norwegian, the World’s Best Low-Cost Long-Haul Airline and the world’s fastest-growing airline, today launches flights from Oakland International Airport to London’s Gatwick Airport; this is the first nonstop route from this airport to the United Kingdom. Increased demand from business and leisure passengers contributed to Norwegian’s growth in April. The company carried almost 2.3 million passengers this month, an increase of 168,000 passengers as compared to April of previous year. The load factor was 84.5 percent, up 2.1 percentage points. Norwegian stands firmly behind the decision of the U.S. Department of Transportation (DOT), supported by the Departments of State and Justice, to grant Norwegian Air International (NAI) a foreign air carrier permit under the U.S.-EU Open Skies Agreement. NAI’s application is supported by scores of US airports, communities, travelers, travel, tourism and business interests. Norwegian today reported its first quarter results for 2016 with an underlying improvement of more than 400 MNOK ($49m), compared to the same quarter previous year. The company’s intercontinental and Nordic routes had a positive impact on the results. The load factor was record high at 85 percent, in a quarter that is traditionally considered low season. The U.S. Department of Transportation has today issued an order proposing to grant a foreign air carrier permit to Norwegian Air International. When made final, the permit will allow Norwegian Air International to begin operations to the U.S., including the first-ever service between Boston and Cork, Ireland. 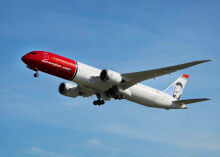 Norwegian has signed an agreement to lease an additional two new Boeing 787-9 Dreamliners, enabling the company to launch even more intercontinental routes. Both aircraft are scheduled to be delivered in 2018. With this new agreement, the company’s long-haul fleet will consist of 40 Dreamliners by 2020. Norwegian will resume its seasonal service from San Juan to Europe in November following a successful first winter season. The St. Croix-Copenhagen route will also return. The world’s fastest-growing global airline launched flights from San Juan’s Luis Muñoz Marín International Airport to London, Copenhagen, Oslo and Stockholm, and from St. Croix to Copenhagen last November.